Ever wonder what the difference is between Last Cost and Most Recent Cost on reports and other functions in Inventory Control (IC)? Don’t worry, you are not alone. These fields are used for two main purposes, one to track the unit cost for some transactions when the items account set utilizes the Most Recent Cost and for reporting to provide different options for the purpose of inventory analysis. Even if these are not your selected costing methods for inventory they can be beneficial in evaluating your inventory and looking for trends. To understand these, let’s review all four of the main costing methods in Location Details, Standard, Most Recent, Average, and Last Unit. 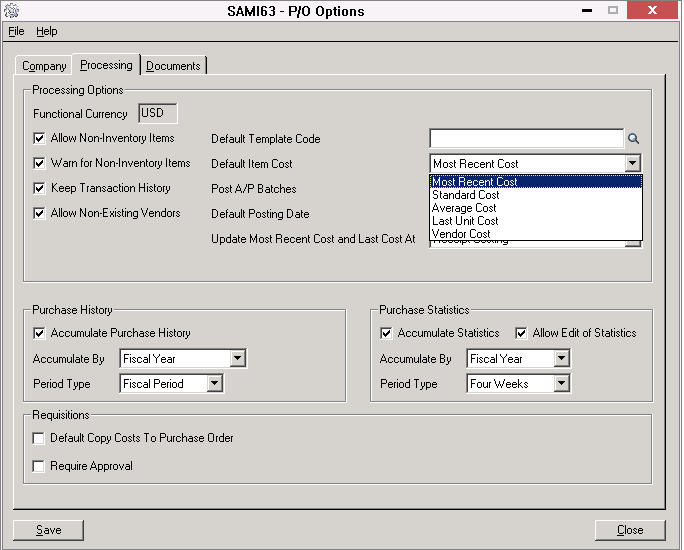 For the purpose of this post, we will omit the two alternate costing methods available in Sage 300 Inventory Control. The most recent cost is updated with each receiving document. Any additional costs entered against the receipt are pro-rated to items and are included into the most recent cost. Taxes entered on the receipt are also included in the most recent cost. Costs are updated in the location details not when the receiving is done, but when the Day End process is run following the transaction. Note, Inventory will use the most recent cost when inventory is allowed to go negative or no receipts are entered for an item at a given location. The most recent cost can be overridden at any time manually in location details, however it will be updated by any subsequent transactions. Last cost, or last unit cost, is not the same as the Last In First Out (LIFO) costing method. Last cost is the amount of the item on the last receiving document. The key difference between the last cost and the most recent cost is last cost does not include any additional costs entered against the receipt. Any taxes entered on the receipt are also excluded from the last cost. The last cost can be overridden at any time manually in location details, however it will be updated by any subsequent transactions. The average cost, sometimes called the weighted average cost, is a rolling valuation defined as the total cost divided by the total number of units. Costs are updated during Day End Processing. The average cost can be overridden at any time manually in location details, however it will be updated by any subsequent transactions. Standard cost is defined by the user and either entered manually or via import. This costing method is useful when your inventory turnover is frequent or your item costs vary little. 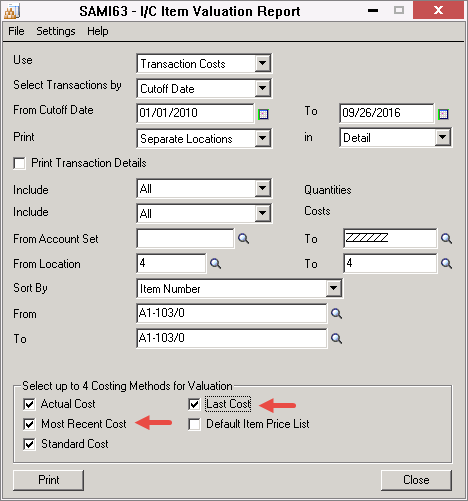 Costs can be entered into the location details standard cost field as a reference or targeted amount if the item is configured with an account set that does not utilize the standard costing method. During transactions when standard cost is being used, Sage 300 (Accpac) will ship goods using the standard cost and offset the difference between the standard cost and the average cost to the cost variance account. Inventory is valued at the moving average cost and receipts are valued at the actual cost. When reports are run, the user can select up to four costing methods. The actual cost is the cost tracked over time defined by the item’s costing method configured via the account set in the item master. The purpose of having the different costing methods available on the report is to provide a comparison for decision making and analysis. For example, for items using standard costs, periodically reviewing the last and most recent costs could use this report as an option to identify the need to update standard costs. Having the different costs can also be used during a period end close review of inventory to indicate the potential need for an inventory adjustment if actual costs are significantly different from one of the other costs. The reasons for a difference are multiple and vary by company, and could be for very legitimate reasons. The purchase order module can be configured to default to one these four values, plus an option to use the vendor cost defined in IC Vendor Details. Timing is important to understand when creating a purchase order. The value entered on the PO is set when the line item is created on the PO. Any subsequent cost updates made after the PO is initially created will not be reflected on the PO. Of course, when the PO is received and invoiced, the actual costs will be reflected and the various costs will be updated accordingly for future transactions. Chosing a default costing method does not determine the accounting value for your inventory but it can be an aid to ensure the PO cost will default to the most accurate cost based upon your business and industry. Using the right inventory costing method is critical in managing how your costs hit your income statement. One question that is often asked, what is the difference between Last Cost and Most Recent Cost. Whereas the names sound similar, there are some important differences. Last Costing, sometimes called LIFO or Last In First Out, maintains multiple costing buckets for each receipt of goods. Then when goods are shipped, Sage will take the items out of the bucket with the latest transaction date until it used up and then begins to take items out of the next oldest bucket. Each bucket tracks not only the quantity but the cost that it was received at. Inventory on the balance sheet is the sum of the amounts remaining in all the cost layers. Example: If you receive 10 items at $10 each on the first of the month, then 10 more items at $20 each the next day, you have two layers totaling 20 units and $300. If you ship 15 items on the third of the month, the first 10 will be costed at $20 and the remaining 5 will be costed at $10 for a total of $250 and leaving the remaining 5 units in inventory at a total of $50. Most Recent Cost does not maintain separate cost layers, but everything is in one bucket. Each time a receipt of goods is done, the total cost is updated and the most recent unit cost is updated to match this transaction. The inventory balance is calculated at average cost. 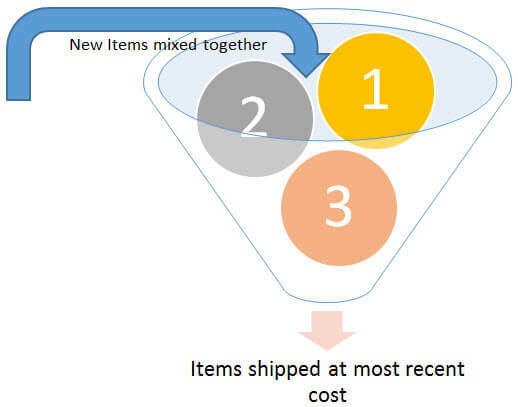 When product is shipped, inventory is relieved at average cost and the difference between average cost and the most recent cost received is expensed to the cost variance account. Example: If you receive 10 items at $10 each on the first of the month, then 10 more items at $20 each the next day, you have one bucket totaling 20 units $300 with an average cost of $15 per unit. If you ship 15 items on the third of the month, inventory will be reduced by $225 (15 * $15) and the cost variance account will be hit for $75 (15 * ($20-$15)). The remaining inventory of 5 units will have a value of $75. Does this article spark additional questions about your unique inventory management situation? Give us a call at 866.436.3530 and one of our experienced consultants would be happy to conduct a business review to help you understand how to best optimize your inventory costing. You may also be interested the Sage Inventory Advisor and learn more about how-to reduce excess inventory, minimize stock-outs and manage inventory replenishment.